Silence is the Ocean, and words are a river. do not look for the river. Don’t turn away from the Ocean. Surrender that God knows the way. even in the Presence of God. mere babble in the Presence of Vision. but for the one who is absent. this traditional knowledge is all vain. do away with all intermediaries. books and intermediaries become tiresome. One speaks words only to help others understand. and this is evidence of your own neglect and absence. Silence is for your good. 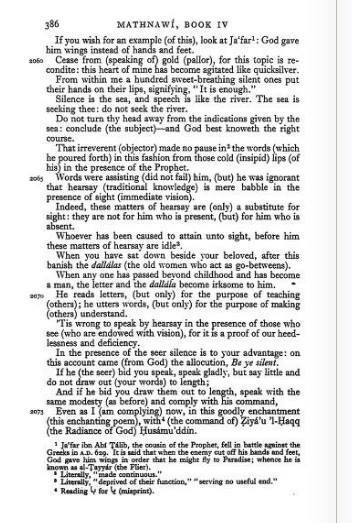 Bryce Haymond’s paraphrase of Reynold A. Nicholson’s translation, The Mathnawi of Jalalud’ din Rumi, Book IV, 386.